Original Editor - Wendy Walker. 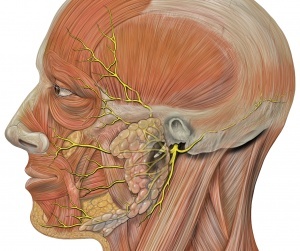 For more detail on the anatomy of the facial nerve, please see the Facial Nerve page. The VIIth cranial Nerve has its nucleus in the Pons and takes a rather winding route before exiting the skull through the stylomastoid foramen. 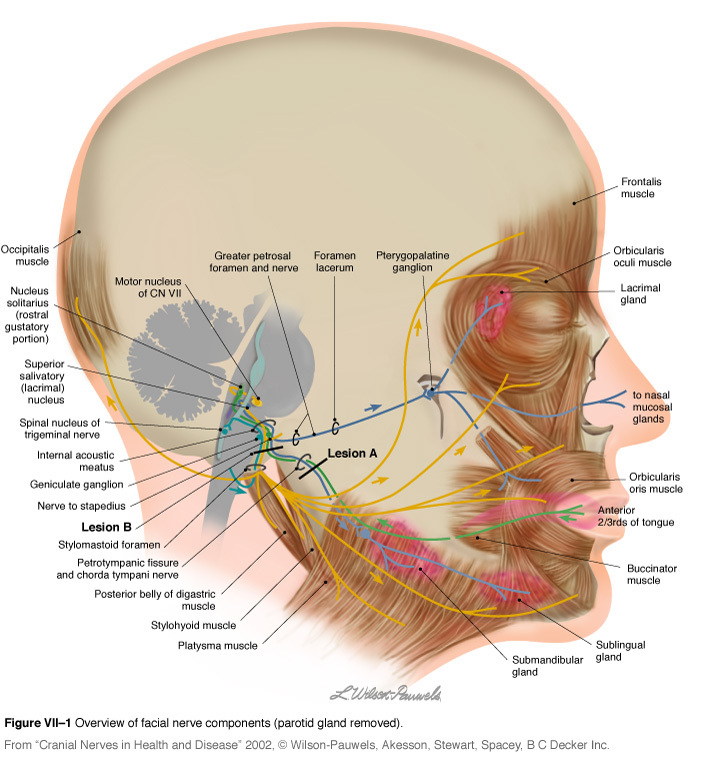 It then passes through the parotid gland, splitting into 5 branches: Temporal, zygomatic, buccal, mandibular and cervical. A tumour compressing the facial nerve can result in facial paralysis, but more commonly the facial nerve is damaged during surgical removal of a tumour. The most common tumour to result in facial palsy during surgical removal is the Acoustic Neuroma (AKA Vestibular Schwannoma). Less commonly, cholesteatoma, hemangioma, Facial Schwannoma or parotid gland tumours (or the surgery to remove them) are the cause. Caused by Herpes Zoster infection = a syndromic occurrence of facial paralysis, herpetiform vesicular eruptions, and vestibulocochlear dysfunction. Patients presenting with Ramsay Hunt syndrome generally have a greater risk of hearing loss than do patients with Bell palsy, and the course of disease is more painful. Moreover, a lower recovery rate is observed in these patients. Infection with Borrelia burgdorferi via tick bites is another cause of facial paralysis. Of patients affected with Lyme disease, 10% develop facial paralysis, with 25% of these patients presenting with bilateral facial palsy. Iatrogenic facial nerve injury occurs most commonly in temporomandibular joint replacement, mastoidectomy, and parotidectomy. At rest, the affected side of the face may "droop"
The lower eyelid may drop and turn outward - "ectroprian"
The facial nerve supplies the lachrymal glands of the eye, the saliva glands, and to the muscle of the stirrup bone in the middle ear (the stapes). It also transmits taste from the anterior 2/3 of the tongue. Lack of tear production in the affected eye, causing a dry eye, with risk of corneal ulceration. 1. The greater petrosal nerve, derived from the facial nerve, supplies the parasympathetic autonomic component of the lacrimal gland. - controlling production of moisture/tearing in eyes. 2. The zygomatic branch of the Facial Nerve supplies Orbicularis Oculi, and the resulting paralysis causes inability(or reduced ability) to close the eye or blink, so the tears (or indeed artificial lubrication in the form of drops, gel or ointment) are not spread across the cornea properly. If the forehead is not affected (ie the patient is able to raise fully the eyebrow on the affected side) then the facial palsy is likely to be a result of a lesion in the Upper Motor Neuron (UMN). Paralysis which includes the forehead, such that the patient is unable to raise the affected eyebrow, is a Lower Motor Neuron (LMN)lesion. However, caution is advised in using preservation of forehead function to diagnose a central lesion. Patients may have sparing of forehead function with lesions in the pontine facial nerve nucleus, with selective lesions in the temporal bone, or with an injury to the nerve in its distribution in the face. It is worth remembering that a cortical lesion that produces a lower facial palsy/paresis is usually associated with a motor deficit of the tongue and weakness of the thumb, fingers, or hand on the ipsilateral side. Laboratory investigations include an audiogram, nerve conduction studies (ENoG), computed tomography (CT) or magnetic resonance imaging (MRI), electromyography (EMG). According to a clinical guideline, clinicians should not obtain routine laboratory and imaging testing in patients with new-onset Bell’s palsy. Medical and surgical management depends on the cause of the facial palsy. Bell's Palsy and Ramsay Hunt Syndrome are treated with corticoteroids (prednisone), given within 72 hours of onset,and this can be accompanied by antiviral medication. Acoustic Neuromas or Facial Schannomas are frequently resected surgically. See Acoustic Neuroma page for more details. Patients at high risk of corneal ulcer may be offered oculoplastic surgery to protect the eye. According to clinical practice guidelines, physiotherapy is not recommended in Bell's palsy. Mime therapy can improve functionality for patientswith facial palsy.The therapymust consist of exercises with mirrors, which are both low cost and easily available, and the patient must help in the execution of the movements for both biofeedback purposes and to prevent synkinesis. Effect of electric stimulation is controversial. PNF technique is effective than conventional exercises. Kabath technique is effective than no exercise. Synkinesis (AKA aberrant regeneration) occurs after injury to the facial nerve. For more information on this, see the dedicated Synkinesis page. A large retrospective study [920 patients] published in September 2018 looked into the correlation between facial palsy severity and quality of life; it concluded "A correlation between facial palsy severity and quality of life was found in a large cohort of patients comprising various etiologies. Additionally, novel factors that predict quality of life in facial palsy were revealed". jama.jamanetwork.com/article.aspx Combined corticosteroid and antiviral treatment for Bell palsy: a systematic review and meta-analysis. de Almeida JR, Al Khabori M, Guyatt GH, Witterick IJ, Lin VY, Nedzelski JM, Chen JM. ↑ 1.0 1.1 1.2 1.3 1.4 Zhao Y, Feng G, Gao Z. Advances in diagnosis and non-surgical treatment of Bell's palsy. Journal of otology. 2015 Mar 1;10(1):7-12. ↑ Clark JR, Carlson RD, Sasaki CT, et al. Facial paralysis in Lyme disease. Laryngoscope. Nov 1985;95(11):1341-5. ↑ Hohman MH, Bhama PK, Hadlock TA. Epidemiology of iatrogenic facial nerve injury: a decade of experience. Laryngoscope. 2014 Jan;124(1):260-5. ↑ 7.0 7.1 7.2 Baugh RF, Basura GJ, Ishii LE, Schwartz SR, Drumheller CM, Burkholder R, Deckard NA, Dawson C, Driscoll C, Gillespie MB, Gurgel RK. Clinical practice guideline: Bell’s palsy. Otolaryngology–Head and Neck Surgery. 2013 Nov;149(3_suppl):S1-27. ↑ Jenny AB, Saper CB. Organization of the facial nucleus and corticofacial projection in the monkey: a reconsideration of the upper motor neuron facial palsy. Neurology. Jun 1987;37(6):930-9. [Medline]. ↑ Kumar A, Mafee MF, Mason T. Value of imaging in disorders of the facial nerve. Top Magn Reson Imaging. Feb 2000;11(1):38-51. [Medline]. ↑ 10.0 10.1 Pereira LM, Obara K, Dias JM, Menacho MO, Lavado EL, Cardoso JR. Facial exercise therapy for facial palsy: systematic review and meta-analysis. Clinical rehabilitation. 2011 Jul;25(7):649-58. ↑ ^ Gronseth, GS; Paduga, R (2012 Nov 7). "Evidence-based guideline update: Steroids and antivirals for Bell palsy: Report of the Guideline Development Subcommittee of the American Academy of Neurology". Neurology 79 (22): 2209–13. ↑ Manikandan N. Effect of facial neuromuscular re-education on facial symmetry in patients with Bell's palsy: a randomized controlled trial. Clin Rehabil. 2007 Apr;21(4):338-43.fckLR*Electromyography (EMG) Biofeedback&nbsp;&lt;ref&gt;Bossi D, Buonocore M et al. Usefulness of BFB/EMG in facial palsy rehabilitation. Disabil Rehabil. 2005 Jul 22;27(14):809-15. ↑ 16.0 16.1 Monini S, Iacolucci CM, Di Traglia M, Lazzarino AI, Barbara M. Role of Kabat rehabilitation in facial nerve palsy: a randomised study on severe cases of Bell's palsy. Acta Otorhinolaryngologica Italica. 2016 Aug;36(4):282. ↑ 17.0 17.1 Beurskens CH, Heymans PG. Mime therapy improves facial symmetry in people with long-term facial nerve paresis: a randomised controlled trial. Australian Journal of Physiotherapy. 2006 Jan 1;52(3):177-83. ↑ de Almeida JR, Guyatt GH, Sud S, Dorion J, Hill MD, Kolber MR, Lea J, Reg SL, Somogyi BK, Westerberg BD, White C. Management of Bell palsy: clinical practice guideline. Cmaj. 2014 Sep 2;186(12):917-22.